Ghana’s George ‘Red Tiger’ Ashie will seek to announce himself to the boxing world in a test of his readiness to take on the best lightweights in world boxing against Stephen Ormond of Ireland in the UK on August 24. Ashie (28-4-1, 20 KOs), a former Commonwealth champion recently signed a 3-year management deal with Dubai based MTK Global and begins work with the highly successful boxing company when he takes on Ormond (25-5, 13 KOs) at the Emirates Arena in Glasgow, Scotland late next month. The Ghanaian is currently ranked number 14 in the WBO lightweight world rankings and also holds the WBO interim Africa lightweight belt on the back of defeating South Africa’s Michael Mokoena in Accra in April. Now he will have to make a case for a rise in the rankings and a possible crack at the WBO world title held by Mexico’s Raymundo Beltran with a good show against 35 year old Ormond who previously won both the WBO European and IBF intercontinental lightweight titles. The Irishman is coming off a return to the ring and to winning ways following a decision over Spain based Nicaraguan, Nelson Altamirano on 15 June. Ormond had lost his previous two fights and his two titles, first to Craig Evans for the WBO European belt in June last year before also losing the IBF intercontinental crown to Paul Hayland Jnr in Belfast last October. For Ashie, it will be a first fight outside Ghana for the first time since 2006 when he fought twice in the UK, both ending in defeats to Martin Watson in Edinburgh, Scotland and Kevin Mitchell in London for the Commonwealth super featherweight title. 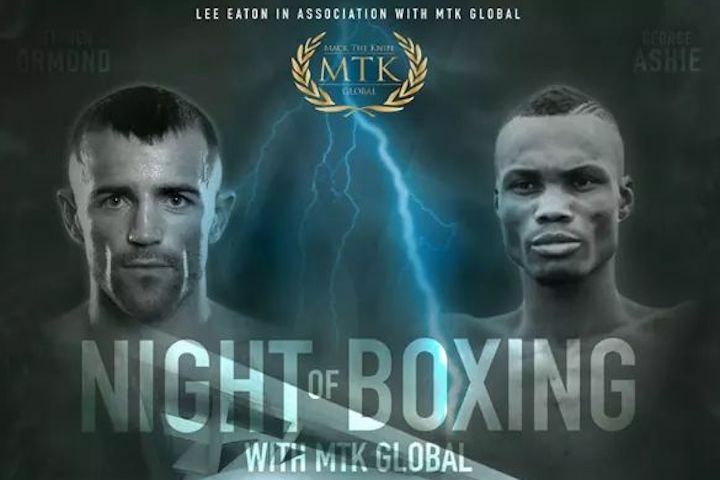 All his fights since have been in Ghana during which he lost only once, dropping a controversial decision to local rival, Emmanuel ‘Game Boy’ Tagoe in November 2013 and according to Mike Altamura, MTK Global’s International Consultant, the clash against Ormond away from home is just the perfect test Ashie need to push up his world title credentials. “Ormond is a very strong, quality fighter, but the type Ashie needs to overcome if he’s destined for bigger fights,” Altamura told this writer on Thursday. “It’s a great opportunity live on Box Nation and hopefully if a broadcaster comes to the table, beamed back to Ghana live too. Definitely a tough fight for Ashie but a must win for him to continue toward a world title fight,” Altmaura affirmed.